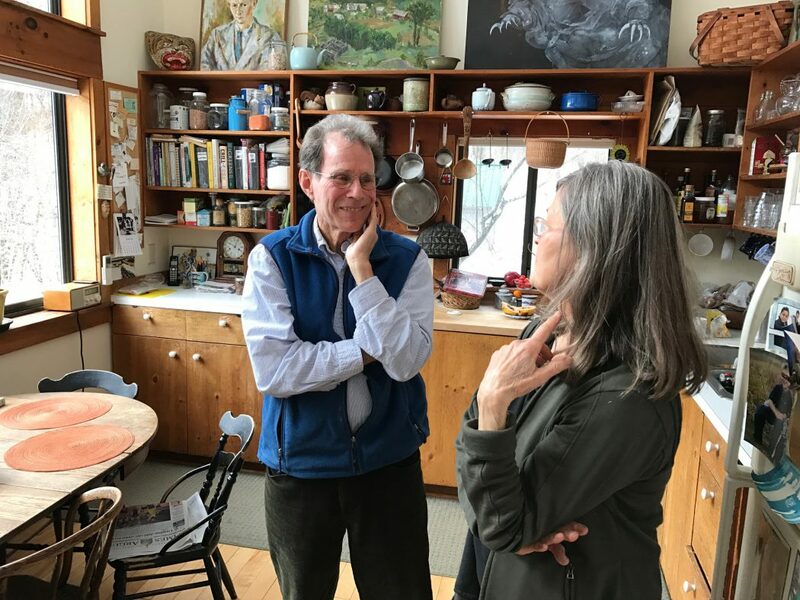 Johnson and his wife, Nona, to whom he dedicated the book, in the couple's Vermont kitchen. 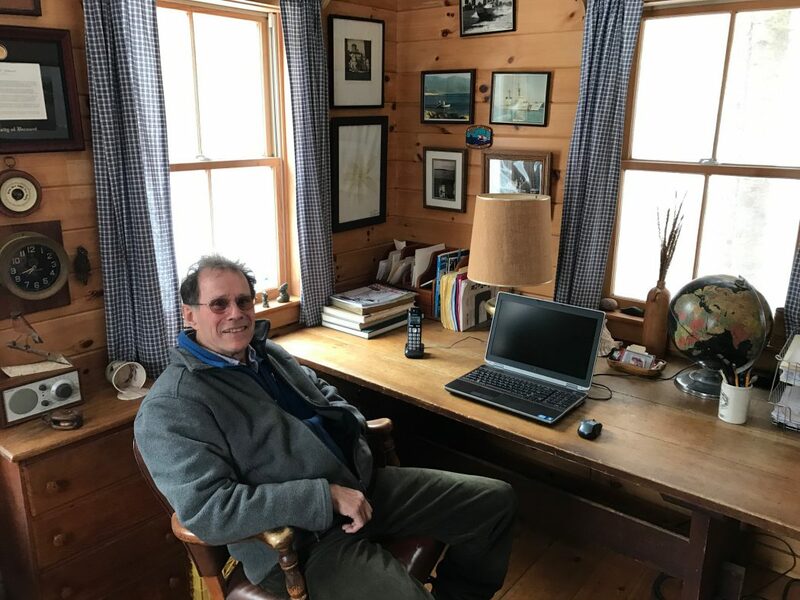 Charles Johnson ’65 talks about his book, Ice Ship, during a podcast with Richard Paige at Johnson's home in Vermont. The following is the preface to Ice Ship: The Epic Voyages of the Polar Adventurer Fram, by Charles Johnson ’65. 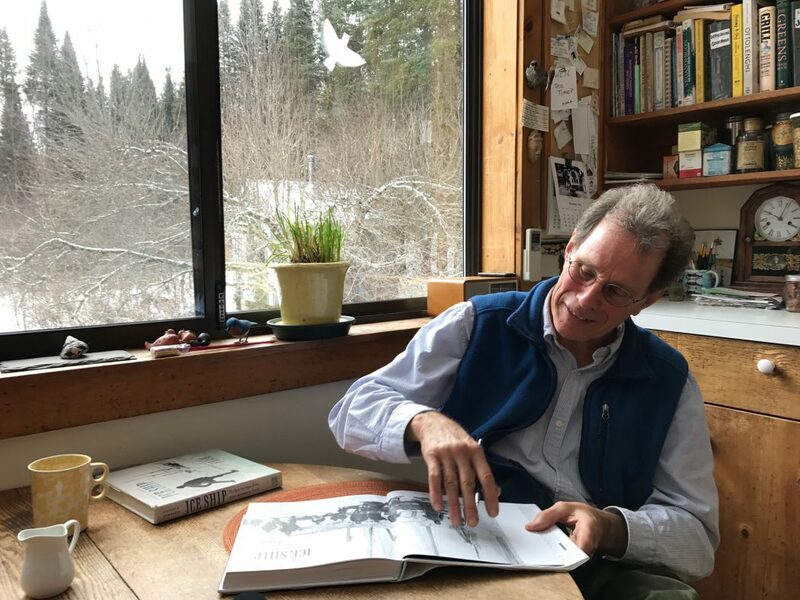 The retired naturalist for the State of Vermont, Johnson has been fascinated with the sea and polar exploration since his boyhood, when he spent summers on the Elizabeth Islands, off the coast of Massachusetts. The evocative prose of this introduction captures that fascination as well as the writer’s lyrical style and fine eye for detail. My eyes adjust to the subdued light in the cool, cavernous building where it is now, forever off the oceans, forever away from the polar ice and brutal weather it often endured. It sits on big wooden blocks, black-hulled and massive, in this quiet, somber setting. It’s voyages are done, its work long since over. But this is not a mausoleum; it is not lying in state. It is very much alive. Its energy and history wash over me as I come close. As I let my hand run over its ancient skin, its deep scars, I am taken back to when I was little and heard my father talk of it with such awe and admiration, almost reverence, tinged with affection. Even then I sensed it had a life of its own, a personality built not just of the wood and iron but also by adventures at the far ends of the earth, by those who took it there. I had been eager to listen to stories about it, feel a bit of what others had felt who shared so many years with it. Now here I am, after all these years, ready to take in what the old ice ship will reveal to me, fully awake to what I had only dreamed before. As I walk along its 128-foot length, I am struck by how massive yet graceful it is, a perfect blend of opposites. Its hull is smooth, steep-sided, and rounded at the bottom, so that encroaching ice could not grab, squeeze, and crush, but instead would slide up on it. Its bow and stern, armored with thick iron plates, are edged like wedges for smashing through. On board, there is solidity everywhere, a kind of geologic permanence that its long, rough history has not diminished. Its sides are two feet thick, four feet at stem and stern. Below decks are great bracing wooden knees and buttresses athwartships, skewered to the timbers by thick iron rods and bolts. Its three masts are like enormous trees, rooted in the keelson, from which the trunks rise majestically, pass through the deck above, and head toward the sky. I move slowly through the living spaces below decks where the men slept, ate, read, sang, sometimes fought, and especially gathered for company on those interminably long winter nights, those years away from home. I sense the snugness of their staterooms, insulated with wool, felt, and reindeer hair, which kept them warm even in the deepest subzero frigidity outside. The names from all three expeditions are etched in small metal plates above the stateroom doors, and I pause at each, remembering, then peer inside, looking for ghosts, or maybe feeling them. I linger longest at the one that says, “Fridtjof Nansen 1983-1896”—the man whose idea it was, who brought it into being. He was the man whose unsmiling, enigmatic gaze from his photographs in Farthest North always drew me in, made me wish I were one of them. Now I am here, on his ship, beginning my own voyage. —Charles Johnson ’65, the preface to Ice Ship: The Epic Voyages of the Polar Adventurer Fram, published by ForeEdge, an imprint of the University Press of New England, 2014.